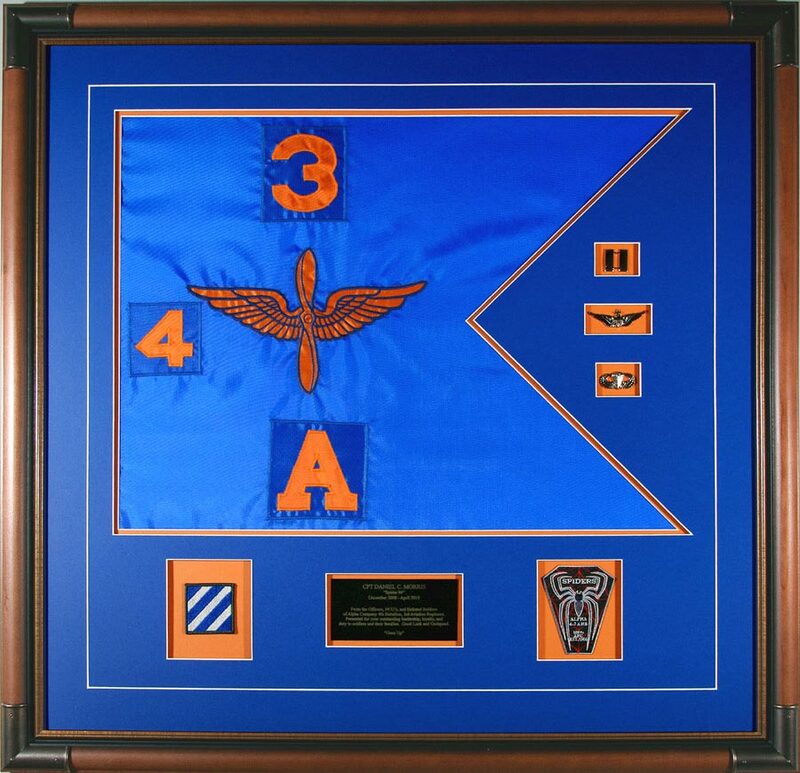 We custom frame guidons and military flags from all branches of the service. Each flag is framed with the highest regard for quality using acid-free materials and UV protected glass or acrylic. All framed guidons undergo strict quality checks to insure the completed project is not only visually outstanding, but fulfills your custom design requirements. Military guidons by themselves represent only a small part of the framing process. An elaborate design may contain a number of objects placed into the frame that includes the guidon, unit patches, insignia, coins, medals and a name plate. 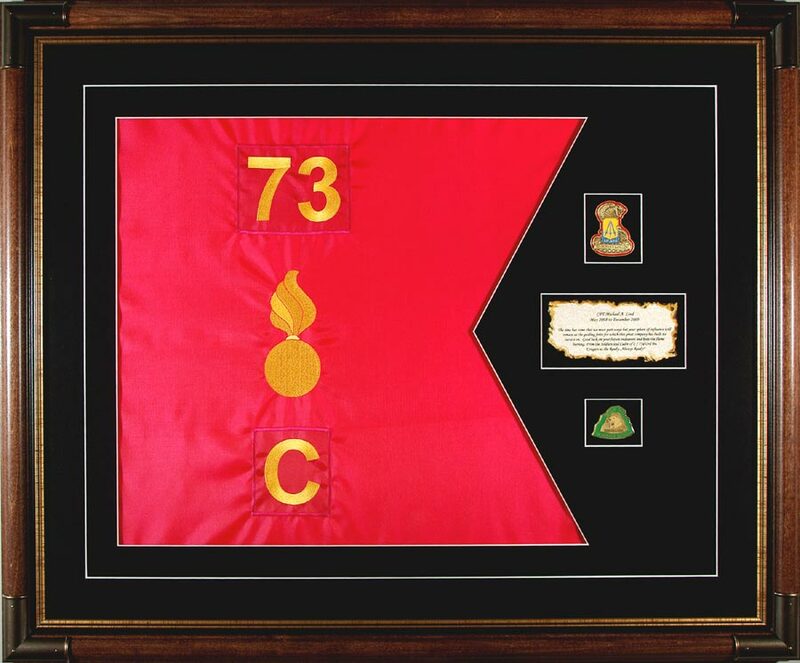 Calvary guidons and battalion colors are often framed and given as farewell or retirement gifts. We have framed these to include a number of personal objects. If you are looking for a simple flag frame with a simple design, we offer the presentation case shadowbox. For a more elaborate gift presentation, we can design the framed guidon to match the personality of the soldier. 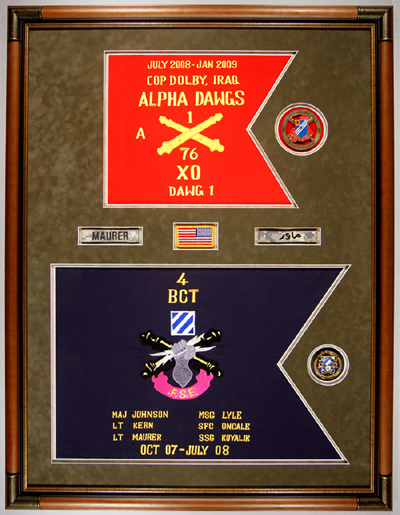 Our sister site Framed Guidons offers custom guidons for sale and custom guidon framing. http://framedguidons.com offers a comprehensive explanation of the guidon framing process, with a number of illustrations. The site also contains information to help make informed decisions about selecting a custom picture framer. Below are several examples of framed flags and guidons. One of the most popular ways to frame a flag is to place it inside a deep presentation shadowbox frame. 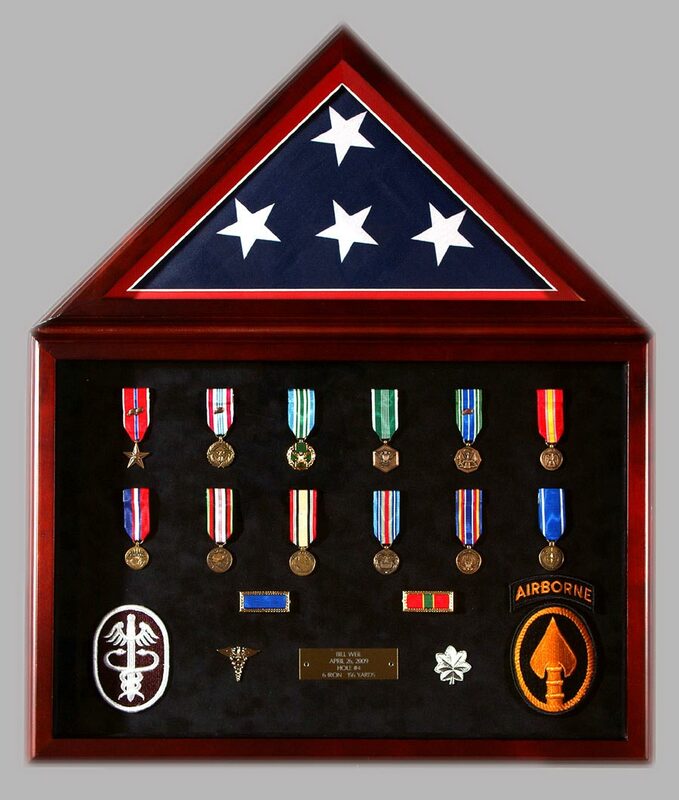 The placement of medals and other memorabilia are often included in the frame as a tribute to a long and distinguished military career. This example was presented as a retirement gift, and includes rank, insignias, patches, medals and a custom name plate. We frame flags, photographs and medals as well as a wide assortment of military objects. Contact us with your requests, pricing inquires or questions about framing and design. This example includes the challenge coin and a custom name plate. The acid free mat was custom cut in the shape of the guidon flag and a white V-groove was an added creative design. Every framed flag and guidon is hand sewn in place which prevents the flag or guidon from falling and sagging over time This design is often used for retirement or farewell gifts. Contact us if you have questions regarding pricing or design. This framed Army Aviation guidon is an example of the many styles of custom frame designs we offer. In each project mat colors are selected to highlight the guidon. A custom name plate is added to designate the place and time of service. Multiple custom mat openings are used to accommodate each military item. A white V-groove is cut into the mat to encompass the guidon and military memorabilia for greater effect. The designs vary according to the subject material. 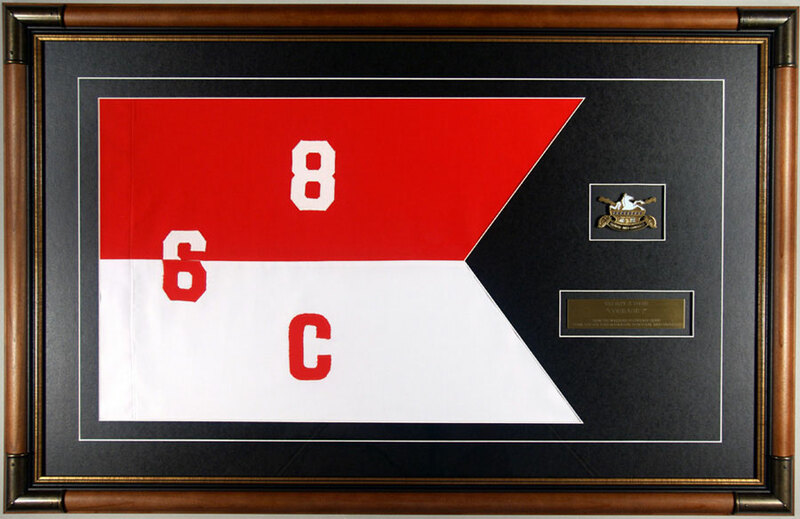 We can place a wide assortment of items into a custom frame with the guidon to commemorate a military career or a duty assignment. .
We have custom framed a number of double guidons for various military units for use as retirement and farewell gifts. This example also includes patches and insignias to reflect a tour of duty in Iraq. However, there are endless design possibilities that can include using a number of personal items which reflect a soldier’s distinguished military career. The wood frame has a natural a wood grain finish with brass colored metal corner caps. This frame is one of the most popular profiles selected by our customers with a military theme. If you are stationed at Fort Stewart in Hinesville or Hunter Army Airfield in Savannah, we are located nearby in Richmond Hill, GA. If you have questions about pricing or design, please feel free to contact us. 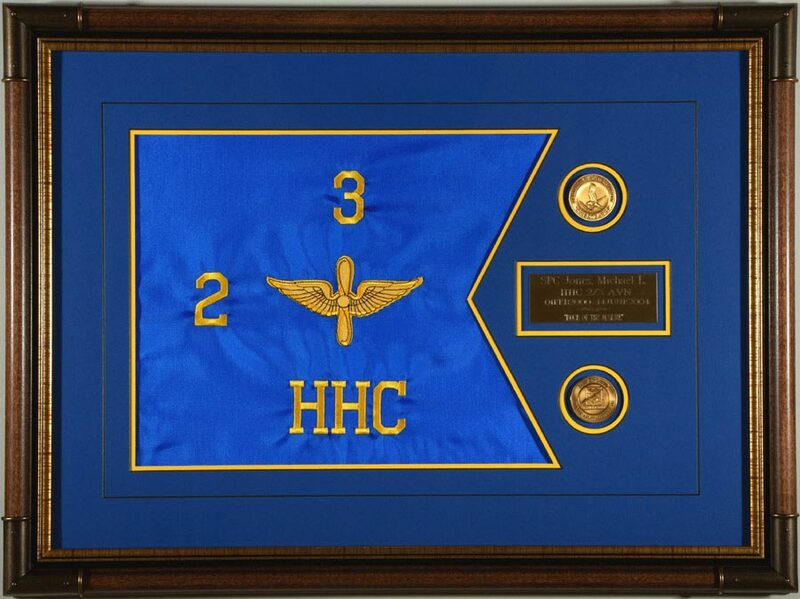 This Aviation guidon was framed using a custom cut acid free mat that matches the shape and color of the guidon flag, custom name plate and unit coins. A black V-groove is cut into the outer perimeter of the mat for added design effect. Every flag and guidon is hand sewn in place and framed with attention to detail. We strive to produce a quality product that satisfies our customers, and honors a soldier’s loyalty, sense of duty and commitment to our country’s freedom. This completed project shows a custom cut acid free mat with openings for the Ordinance guidon, coins and name plate. A white V-groove is cut around the perimeter for an added design effect. Each flag we frame is hand sewn in place to prevent sagging. Various design options exist for custom framing a project. We can include personal objects around the flag and make the frame larger or smaller depending on the design. This battalion colors flag was framed using all acid free materials, consisting of a rich deep red suede top mat with an added v-groove around the entire design. The bottom gold mat was selected to match the background gold of the flag and to enhance the coins and name plate at the bottom. The solid wood frame is a light brown tone with accented metal corner caps giving a high quality military look. The glazing selection is a 99% UV acrylic due to its light weight features, since the size of this frame was so large (37 inches wide x 47 inches tall). This is truly a spectacular farewell gift any soldier would be delighted to receive! Contact us if you have questions regarding pricing, design, or custom framing. 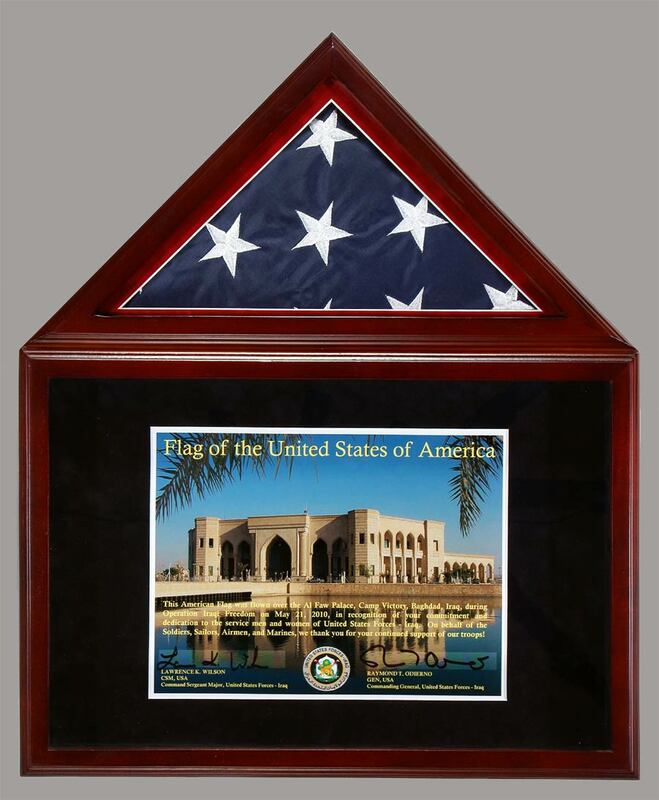 The Flag of The United States is framed with a certificate indicating that it was flown over a duty station in Iraq. Personal items can also be included in a shadow box frame like this one. The certificate is surrounded by a deep blue suede mat. The flag, along with the certificate are an exceptional tribute to our dedicated soldiers. 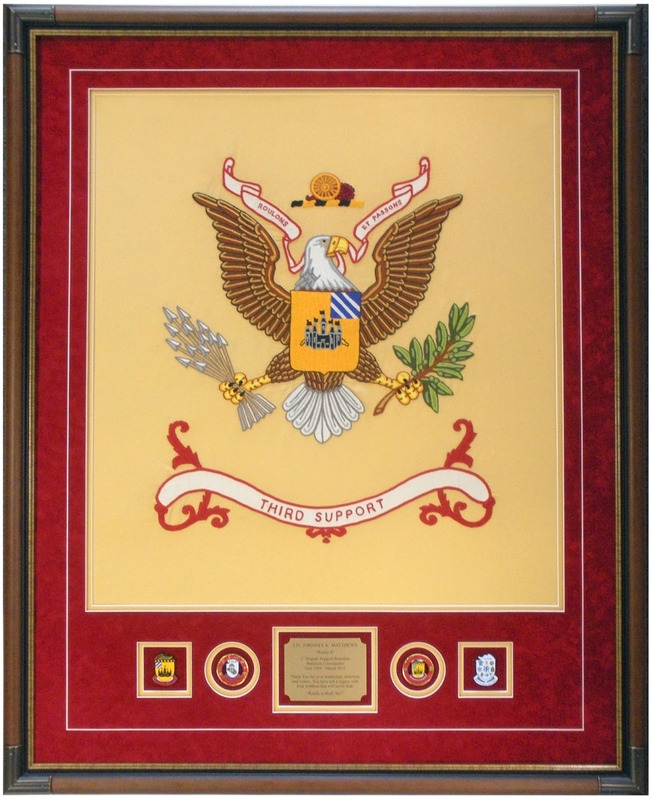 We have framed a number of these as gifts to honor civilian recipients. 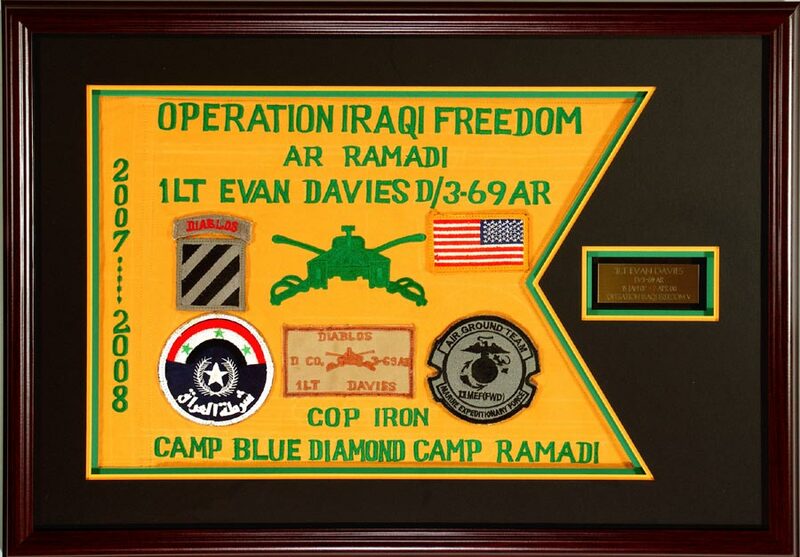 The Operation Iraqi Freedom guidon is framed with triple acid free mats of like colors and a custom name plate. Cindy's Custom Framing & Antique Art is proud to frame guidons from Ft. Stewart and from other military bases. We can frame your guidons in a number of ways. Feel free to contact us and we will gladly assist you in putting together a unique framing design.